Last Thursday, we held the first JuntoDay in Chicago, an exclusive learning event for company founders and leaders to "escape the grind to nourish their mind". It was a response to the request from alumni of The Junto Institute for continuing education, as well as companies that want a "taste" of Junto before considering our nine-month apprenticeship program. The long day - which started with breakfast at 7:30am and concluded with dinner ending at 9pm - featured three educational sessions on sales, people, and scaling (click each one for a summary of that session). In between was intensive learning, engaging conversation, actionable takeaways, and shared experiences. 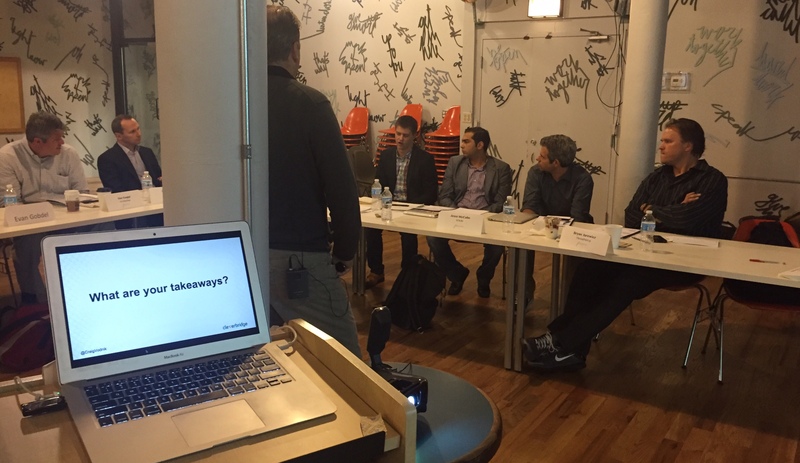 As the day was unfolding, I realized that nothing like it is available in Chicago for startups and growing companies. There is no place for them to go to learn about how to improve their businesses, whether it's understanding sales funnels, crafting a strong company culture, designing a hiring and onboarding process, or learning what scaling is all about and how it affects operations. Colleges and universities offer executive education programs but they're targeted to corporate managers and executives. Service providers offer seminars based on their expertise, not operating experience, and there's usually a thinly veiled agenda if not an explicit sales pitch. And periodically, there is a panel discussion, large-scale conference, or 1-2 hour speaker event. What I'm referring to is specific, organized, and designed learning for the founders, leaders, owners, and operators of growth-stage companies. Such courses and programs exist for aspiring and new entrepreneurs. As mentioned, they exist for corporate folks. There's even well-designed education for non-profit executives. But to this day, based on my experience and observations, no one has figured out how to do this for companies going from stage one to stage two. No one has figured out how to address the specific issues they face in their contexts: Hiring and firing in a startup. How to get better at leadership. How to build a sales process. How to grow a business. Of course, this is the reason why The Junto Institute exists in the first place - to fill a gap in the market. However, our nine-month Apprenticeship program is very different because of its program length as well as the integration of emotional intelligence training and leadership skills. What I'm referring to is focused and designed business education delivered by seasoned entrepreneurs and executives, not service providers or professors or storytellers. Yes, there are plenty of speaking engagements where one can hear from the experiences of founders and entrepreneurs. As someone who has organized and offered many of those - and attended even more - the speakers are usually left to their own devices in crafting their talks and delivering them. But teaching and education are hard. As "students" or "participants", all that we see is the actual instruction. We don't see what happens behind the scenes to design a well-crafted learning experience. Case in point: to make JuntoDay happen, we spent 4-12 hours with each of the presenters to help them design their session: learning objectives to achieve, shared experiences to incorporate, slides to add or delete, lessons learned to emphasize, mistakes made to share, and so on. I imagine they spent at least that much additional time on their own, in some cases even asking us questions via email or phone to ensure they were on the right track. We don't believe in delivering "best practices" because who's the one to judge what "best" is? We believe there are only "proven practices": strategies and tactics that entrepreneurs and companies have put to use and worked for them and their companies. It's fairly easy to have an entrepreneur deliver a speaking engagement to share these. It's a bit harder to create a remarkable learning experience.